In all our lives there are times when we face challenging behaviour from other people. Whether it is a colleague, friend or member of the family whose words or actions are unacceptable or offensive to you, the reason you become so upset is because, actually, you have no direct control. The only thoughts, words and deeds we can be sure of come from our own mind and mouth – and sometimes even our own reactions seem to have a life of their own, if we not practicing full awareness. When people are either in our personal space as they may be at work, or ‘prodding’ our hearts because they are in our family, we are so close that it is difficult not to become embroiled in the drama. Our mind tends to go over and over the situation. This attachment affects our ’emotional body’ which makes up one of the layers of energy which we all know as our aura. Trauma, heated battles and emotional upsets, as well as all types of disease, (not to mention abuse of any kind) are not only mentally and emotionally exhausting, but they can cause serious damage to the aura. This damage shows in the form of cracks, holes and discolouration. Holes in our aura leave us vulnerable to ‘psychic attack’. This doesn’t mean that someone is casting evil spells or sticking pins into a model of us, it simply means we are more than usually affected by other people’s cruel words and unkind actions. (Sometimes when we are very vulnerable we are even affected by and ‘feel’ the injustices in fictional drama from screen plays on the television and cinema). Don’t worry, like everything else in life once you become aware of the problem you can work at putting it right. When we believe in and work with the angels help is always at hand. Think of the aura as being an egg-shaped band of multi-coloured light surrounding your physical body. Like an egg the skin and outer shell is permeable. We exchange energy between the outside world and our inner being through this permeable membrane, and just like the skin and the shell of the egg of a bird protects the chick, it is designed to protect us as we grow. So, how do we strengthen and protect our emotional energies and repair our battered aura so that we are fully protected? Here are a few guidelines you might like to try, and with renewed strength, you will be able to keep out the negative energies allowing your whole light to shine through. * Every time you get out of bed imagine that you are stepping into a ‘hoola hoop’ of bright light and pull this up the whole length of you sealing it at arms reach above your head. * Call upon your guardian angel to help you strengthen the outer ‘skin’, filling it with bright shining light. 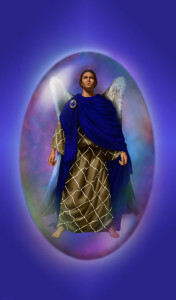 * Call upon Archangel Michael to surround you in his protective blue light throughout the day. * Ask Archangel Raphael to help to heal your aura, and send healing blessings to all those involved. * Send your love into your aura, out to everyone you know then onward and out into the world. * Breathe deeply before any anticipated confrontation and call your angels to stand by your side: “Angels be with me please, to my left, to my right, behind and before me. Thank you”. * Carry a piece of your favourite crystal, or an angel card, with the intention of regularly connecting to your spiritual nature. * Take time out in nature. A ten minute walk lifts our spirits. And finally, meditate, meditate, meditate! Even just 2-5 minutes of deep breathing, sending out blessings in advance before you start the day to centre and ground yourself, brings enormous changes to the energy within and without. Thank you so much for your words arriving at just the right time to correct two situations that happened to me yesterday.